There are many uses for a camera remote – you may need to secure your camera on a tripod and ensure that there is no shake to the camera when shooting, or you may need to expose for long time or maybe you want to just take a picture with yourself in the frame. My old camera, Nikon D90, had a tiny IR remote that I could use for some of these purposes and it cost about $15-20. When you buy a more serious camera, however, Nikon does not make anything cheap to go with it. So you have to start looking for third party tools. 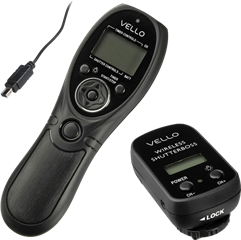 There were 2 or 3 decent wireless remotes that have 10-pin connection for Nikon and in the end I selected one – Vello ShutterBoss (pictured here). While the name leaves a lot to be desired, the actual device is pretty solid and provides a great range of functions to control your camera shutter remotely. You can set up long exposures, delayed exposures, timed and interval exposures, which really helps with a lot of applications. It comes in 3 pieces – actual remote which allows you to control multiple functions, camera cable that links 10-pin connector with the receiver unit. The latter can be (but does not have to be) secured in the hot shoe. I now cannot imagine how I would take long exposure photographs or HDR frames when I want to ensure that there will be no camera shake or shift. All in all – great tool and not very expensive either. When you push ISO to shoot in available light one thing is there for sure – noise. Most modern pro grade cameras allow you to push ISO quite high, however there is still noise and sometimes it’s something you wish you could avoid. Well, fear not, as there is a way to reduce the noise in post production without help from any noise removing software. You will, however, need Photoshop. So, read on about the technique and hope it helps!